These amounts are for one bowl, perfect for those moments when someone in the family needs a quick lunch (presuming you have cooked chorizo on hand!) but by all means multiply the recipe at will for a full family meal. This is a great one bowl lunch. If you want to skip the cooked chorizo (see below for more info on this spicy sausage), or just add some more flavor and protein to this dish, go for beans. There is a new brand of beans on the market, found in the refrigerated sections, called Better Beans, and they are delicious. Favorite types to go in a Mexican-inspired recipe like this one are: Uncanny Refried Black Beans, Roasted Chipotle Red Beans, and Cuban Black Beans. 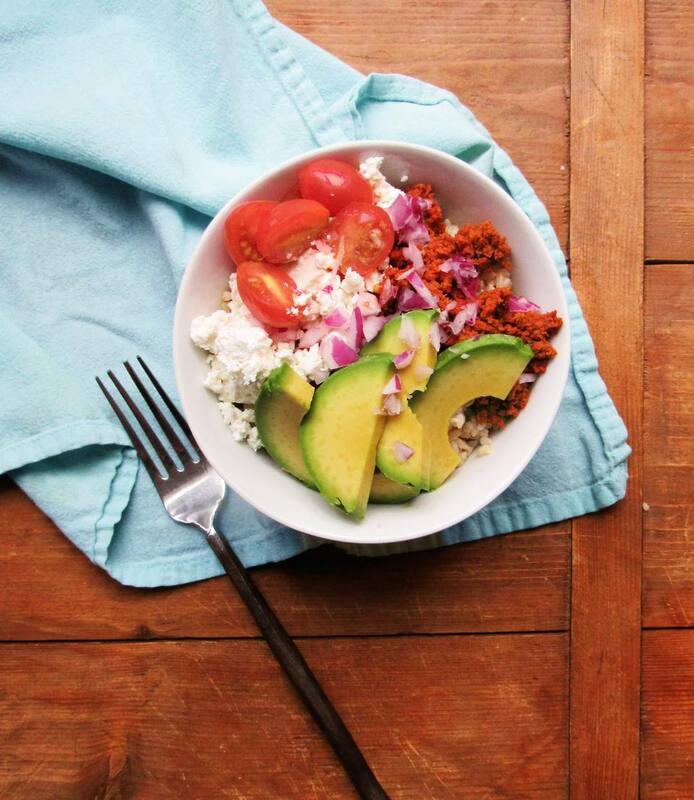 Pile the rice in a bowl, and top with the chorizo, queso, avocado, tomatoes, and red onions. Add salsa or sour cream if desired. When you see a recipe call for crumbled chorizo that is referring to Mexican chorizo which is different from Spanish and other kinds. Mexican chorizo is a spicy ground meat sausage that is usually sold fresh and uncooked, either loose or in a casing. It has to be cooked before eating, and if it’s in a casing, it’s usually removed before cooking, so the result is crumbled cooked sausage meat. You can find it with other raw meats or sausages at the grocery store. It is often made from pork, or a combination of pork and other ingredients, but these days you can find turkey chorizo on the market as well. Regardless of the meat it’s made with, the seasonings added – including chili peppers and vinegar -- usually give it a bight brick red color. It's often used on tacos and very classically with scrambled eggs for breakfast in Mexico. It can also be found providing a pop of flavor in seafood dishes. Use any kind of cooked crumbled chorizo or other sausage, such as pork, turkey, beef, even a vegetarian sausage. Any you can definitely mix and match the cheeses – shredded Monterey Jack, cheddar a Mexican blend, all are good additions to this kind of rice bowl. What to Do with the Extra Avocado? Try it on top on salads like this Sesame-Honey Quinoa and Carrot Salad with Sliced Avocado, or make it the star like in this Avocado Salad with Creamy Miso Dressing. For a heartier lunch, try it in this Grilled Chicken and Avocado Flatbread Sandwich. Or, serve it as an appetizer like this Avocado and Cannellini Bean Crostini with Gremolata. Of course, avocados also great in dips like Creamy Avocado Dip, Avocado Pesto Dip, and Spicy Guacamole. It can even be in a dessert, like this creamy Avocado Green Tea Ice Cream! Kids can crumble the sausage when it’s cooked, after it cools a bit. They also can crumble the cheese and might be able to slice the avocado and the cherry or grape tomatoes.